Rumi (1207-1273), a Sufi scholar/teacher/spiritual-leader was madly drunk with the love of Divine and this exquisite, inexplicable love issued forth from Rumi for the last thirty years of his life. His utterances of the “drunkenness with the Divine” manifested in the form of a single poem that is 64 thousand verses long ! … an unparalleled feat in literature. in pure absence without expectation. Shams changed Rumi’s life forevermore … Rumi was a respected scholar and spiritual leader of his community and when he met Shams he realized that, in Shams, he was “meeting” That which he had been reading and studying about … their 1st “meeting” is a fascinating encounter – several versions exist (we will be sharing this encounter through future posts). And it is interesting to note that Shams sought out Rumi – which is yet another amazing story. From this meeting began their deep Sohbet (mystical conversation on mystical subjects) and they were lost in this for extended periods … so much so that some people in the community became jealous. Shams left for a while and then came back and again their Sohbet began (or their Friendship) … shortly thereafter one night Shams was called away and he never returned! One version says that one of Rumi’s son was responsible for killing Shams. 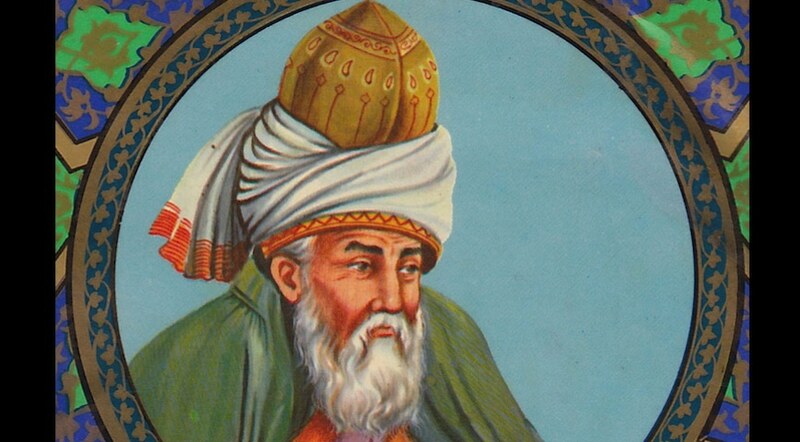 This was a profoundly transformative moment or experience for Rumi – it made him “madly drunk” with The Divine and the thus began the uttering of his extraordinary poetry! … two different persons scribed for the Love Drunk Rumi … the scribe names sometimes appear in the poems (e.g., Husam). There is a force within, which gives you life – seek That. In your body lies a priceless gem – seek That. Don’t look outside, look inside, and seek That.